A decision by the Trump administration to end a temporary residency permit program that has allowed almost 60,000 Haitians to live and work in the United States has the Canadian government on alert for a potential new surge of asylum seekers at the border. The Homeland Security Department said late Monday that conditions in Haiti have improved significantly, so the benefit will be extended one last time — until July 2019 — to give Haitians time to prepare to return home. 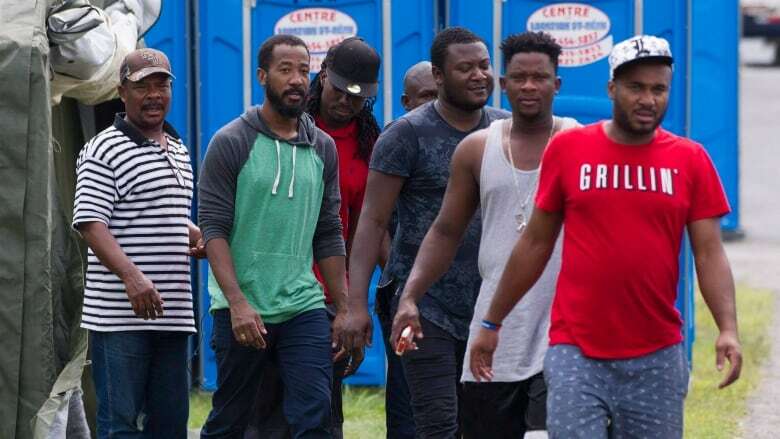 Haitians were placed on notice earlier this year, and, few months later, waves of people began crossing illegally into Canada from the U.S. to claim asylum, catching the Liberals off guard when the crowds began to number more than 200 people a day. A spokesperson for Immigration Minister Ahmed Hussen said while Canada remains an "open and welcoming country to people seeking refuge," anyone entering Canada must do so "through the proper channels." "Entering irregularly is not a 'free ticket' into Canada,"' Hursh Jaswa said late Monday. "There are rigorous rules to be followed and the same robust assessment process applies. Those who are determined to be genuinely at risk, are welcomed. Those who are determined not to be in need of Canada's protection, are removed." "We're following it very carefully," Public Safety Minister Ralph Goodale said, adding the physical apparatus required for the RCMP and border guards to deal with an influx is in place, as are contingency plans for a variety of "what if" scenarios. The surge this summer prompted an outreach campaign to Haitian communities in the U.S. to counter misinformation about Canada's immigration program circulating through social and traditional media channels and blamed for some of the new arrivals. The misinformation — and the government campaign to counter it — continue. Liberal MP Emmanuel Dubourg said that the recent announcement that Canada will accept close to one million immigrants over the next three years ended up as a story in the Haitian press about Canada opening its doors to a million immigrants this year. It was framed as proof Haitians were welcome. Dubourg said he called the paper two weeks ago to clear things up but not before he realized the story had been shared hundreds of times on Facebook. He said there is a great deal of uncertainty in the Haitian community, but the message needs to get out that Canada isn't necessarily a default option. He'll be taking that to New York on Tuesday in his second trip to the U.S. for outreach purposes. "I'm there to inform them: be careful before you make a decision," he said in an interview Monday. Dubourg, who is Haitian, will also be trying to clear up a misconception that asylum is simple to obtain in Canada. He said statistics he has seen suggest the acceptance rate for Haitians who arrived over the summer now sits at 10 per cent, down from about 50 per cent previously. The Immigration and Refugee Board was unable to immediately confirm that number. About 437,000 people live legally in the United States with what's known as temporary protected status, meaning they can't be deported back to their home countries because it is unsafe. The U.S. extended temporary protected status to Haitians after the 2010 earthquake, as did Canada, but Ottawa resumed deportations there this year. Some 262,000 Salvadorans are also awaiting word of a decision on their status, as it's set to expire in March. The Liberals have been reaching out to the Hispanic community, too. Liberal MPs Pablo Rodriguez and Randy Boissonault travelled to Miami and New York late last week and over the weekend as both speak Spanish. "We have upcoming MP-led outreach trips to New York, Texas and California where we will continue to clear up misconceptions circulating about Canada's system," said Jaswal.